Objective: To determine the effect of smoked cannabis on the neuropathic pain of HIV-associated sensory neuropathy and an experimental pain model. Methods: Prospective randomized placebo-controlled trial conducted in the inpatient General Clinical Research Center between May 2003 and May 2005 involving adults with painful HIV-associated sensory neuropathy. Patients were randomly assigned to smoke either cannabis (3.56% tetrahydrocannabinol) or identical placebo cigarettes with the cannabinoids extracted three times daily for 5 days. Primary outcome measures included ratings of chronic pain and the percentage achieving >30% reduction in pain intensity. Acute analgesic and anti-hyperalgesic effects of smoked cannabis were assessed using a cutaneous heat stimulation procedure and the heat/capsaicin sensitization model. Results: Fifty patients completed the entire trial. Smoked cannabis reduced daily pain by 34% (median reduction; IQR = −71, −16) vs 17% (IQR = −29, 8) with placebo (p = 0.03). Greater than 30% reduction in pain was reported by 52% in the cannabis group and by 24% in the placebo group (p = 0.04). The first cannabis cigarette reduced chronic pain by a median of 72% vs 15% with placebo (p < 0.001). Cannabis reduced experimentally induced hyperalgesia to both brush and von Frey hair stimuli (p ≤ 0.05) but appeared to have little effect on the painfulness of noxious heat stimulation. No serious adverse events were reported. Conclusion: Smoked cannabis was well tolerated and effectively relieved chronic neuropathic pain from HIV-associated sensory neuropathy. The findings are comparable to oral drugs used for chronic neuropathic pain. HIV-associated sensory neuropathy (HIV-SN) is the most common peripheral nerve disorder complicating HIV-1 (HIV) infection.1–3 The dominant symptom in HIV-SN is pain, most often described as “aching,” “painful numbness,” or “burning.” Hyperalgesia and allodynia are common, while weakness is rare and usually confined to the intrinsic foot muscles. Extensive preclinical research has demonstrated analgesic effects of exogenous cannabinoids as well as an endogenous cannabinoid system involved in pain and analgesia.12,13 The need for a greater variety of effective therapeutic options has led to heightened interest in evaluating smoked cannabis as a treatment for chronic neuropathic pain. Incorporating an experimental pain model into the assessment of smoked cannabis in patients with chronic pain from HIV-SN provides a standardized reference point for each patient’s subjective ratings of ongoing chronic pain. The Long Thermal Stimulation procedure tests for acute analgesia by measuring the painfulness of a 1-minute heat stimulus.14 The heat/capsaicin sensitization model tests for anti-hyperalgesic effects.15 By simultaneously evaluating acute experimentally induced pain and hyperalgesia and ongoing neuropathic pain, we sought to determine the effect of smoked cannabis on the neuropathic pain of HIV-SN, and to determine if cannabinoids have a more general analgesic and anti-hyperalgesic effect. Patients were adults with HIV infection and symptomatic HIV-SN with an average daily pain score of at least 30 mm on the 100 mm visual analog scale during the outpatient pre-intervention phase. Patients were in stable health, were without current substance abuse (including tobacco), and followed a stable medication regimen for pain and HIV for at least 8 weeks prior to enrollment. Painful HIV-SN was confirmed by symptoms of symmetric distal pain or dysesthesias in the lower extremities for at least 2 weeks, combined with absent or depressed ankle reflexes or sensory loss of vibration, pin, temperature, or touch on examination by the study neurologist (C.A.J.). A family history of polyneuropathy, neuropathy due to causes other than HIV or dideoxynucleosides, and use of isoniazid, dapsone, or metronidazole within 8 weeks prior to enrollment were exclusionary. HIV neuropathy was defined as onset of symptoms without concomitant dideoxynucleoside antiretroviral therapy and nucleoside neuropathy as symptom onset during dideoxynucleoside treatment. Subjects with HIV neuropathy whose symptoms worsened on dideoxynucleoside agents were considered to have both HIV and nucleoside neuropathy. All patients were required to have prior experience smoking cannabis (defined as six or more times in their lifetime), so that they would know how to inhale and what neuropsychologic effects to expect. Current users were asked to discontinue any cannabis use prior to study admission. The study was approved by the Institutional Review Board at the University of California San Francisco, the Research Advisory Panel of California, the Drug Enforcement Administration, the Food and Drug Administration, and the National Institute on Drug Abuse. Written informed consent was obtained from all patients. The trial was monitored by an independent Data Safety Monitoring Board (DSMB) established by the University of California Center for Medicinal Cannabis Research. The study had four phases: a 7-day outpatient pre-intervention phase (study days –9 to –3) to establish eligibility; a 2-day inpatient lead-in phase (study days –2 and –1) in which patients were acclimated to the inpatient General Clinical Research Center setting and baseline measurements were obtained; a 5-day inpatient intervention phase (study days 1 to 5); and a 7-day outpatient post-intervention phase (study days 6 to 12) during which patients continued to record pain ratings each day. Randomization (1:1) to cannabis or placebo cigarettes was computer-generated by the study statistician and managed by an independent research pharmacist. Treatment was double-blind. After hospital admission on day –2, patients were not allowed to leave the hospital or receive visitors. Patients smoked their first cigarette at 2 pm on day 1, and their last cigarette at 2 pm on day 5. Pain model procedures and repeated ratings of chronic pain were incorporated into the first and last smoking session, as shown in figure 1. On the intervening study days, patients smoked, as tolerated, one cigarette three times daily (8:00 am, 2:00 pm, 8:00 pm). Preadmission analgesics were continued throughout the study. Figure 1. Timeline of procedures associated with first and last smoking sessions (day 1 and day 5) and illustration of marking of borders of hyperalgesia on the forearm surrounding the stimulated area. Procedures: LTS = long thermal stimulation—upper arm (45 °C for 1 minute); forearm heat: 45 °C for 5 minutes; forearm capsaicin: 0.075% for 30 minutes; VAS = Visual Analog Scale—Rating of current neuropathic pain; map = map area of secondary hyperalgesia (brush and von Frey); RK = rekindling—forearm (40 °C for 5 minutes). Primary outcome measure: Daily diary pain VAS. Beginning with the outpatient pre-intervention phase and extending through the post-intervention phase, patients completed a diary at 8 am each morning to rate their chronic neuropathic pain during the preceding 24 hours on a 100 mm visual analog scale (VAS) labeled “no pain” at 0 mm and “worst pain imaginable” at 100 mm. Secondary outcome measures: Day 1 and day 5 smoking sessions. Ratings of chronic neuropathic pain VAS. To assess the immediate effect of smoked cannabis on chronic neuropathic pain, patients rated their current pain at 40-minute intervals three times before and three times after smoking the first and last cigarette on a 100-mm VAS (figure 1). In the pilot study, we observed rapid increases in plasma levels of delta-9 THC after 2 minutes (mean = 96.8 ng/mL; 95% CI = 48.7, 145.0) with rapid declines after 1 hour (mean = 6.2 ng/mL; 95% CI = 3.3, 9.2). This study was designed so these measures were collected within the time of peak plasma levels. The long thermal stimulation procedure (LTS) was used to assess acute analgesic effects. Skin on the non-dominant shoulder was heated using a computer-controlled Peltier device with a 15.7-cm2 surface area thermode (TSA 2001, Medoc, Israel).17,18 The probe is held against the skin at a holding temperature of 32 °C and then heated to 45 °C at a linear rate. On reaching 45 °C, pain is then rated continuously using an electronic visual analog scale with a 100-mm linear track for 1 minute before thermode removal. The LTS procedure was performed twice before and three times after smoking. The heat/capsaicin sensitization model was used to assess anti-hyperalgesic effects by inducing neuronal sensitization sufficient to produce an area of cutaneous secondary hyperalgesia that can be mapped and quantified.14,15,17–19 Heat/capsaicin sensitization was induced on a 22.8 cm2 stimulation site on the forearm by using the thermode to heat the skin to 45 °C for 5 minutes followed by treating the stimulation site with topical capsaicin cream (0.075%, Capzaisin HP, Chattem Inc.; Chattanooga, TN) for 30 minutes. Cutaneous hyperalgesia was maintained by heating the stimulation site to 40 °C for 5 minutes (rekindling procedure) at 40-minute intervals. After each rekindling, areas of secondary hyperalgesia were quantified with a 1-inch foam brush and with a 26-g von Frey hair (a mildly noxious pin-like sensation) by stimulating along linear rostral–caudal and lateral–medial paths around the stimulation site in 5-mm steps at 1-second intervals. Starting well outside the hyperalgesic area and continuing toward the treated skin area, the skin was marked where patients reported a definite change in sensation (such as burning, tenderness, or more intense pricking). The distances from the center of the stimulation site were then measured and surface area calculated. The first (baseline) rekindling was performed before smoking and rekindling was repeated three times after smoking. Safety, side effects, and mood ratings. Study sample size was based on an open-label pilot trial in 16 patients with HIV-SN of very similar design.22 The mean reduction in pain was 30.1% (95% CI: −61.2, 1.0). Ten pilot patients (62%) had a greater than 30% decrease in their daily pain, the prespecified criterion of clinically meaningful pain relief.23 Applying the same variances to a randomized, placebo-controlled trial and conservatively estimating that 50% of cannabis patients and 13% of placebo patients would meet the 30% pain reduction criterion yields a sample size of 48 patients with an alpha of 0.05 and a beta of 0.20. Statistical analyses were conducted on a modified intent-to-treat (ITT) sample. All patients who remained in the study at each time point were included in the analyses. 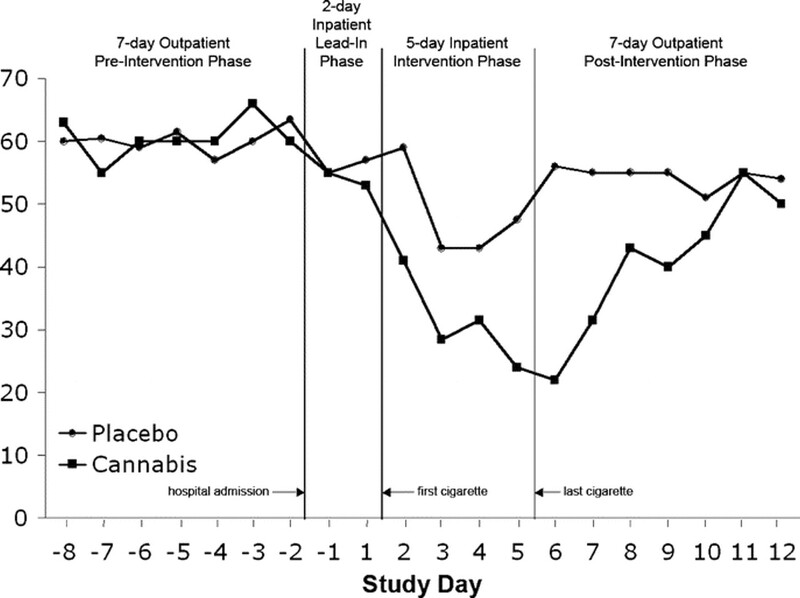 The primary outcome was the proportion of patients in the cannabis and placebo groups who experienced at least a 30% reduction in daily diary pain level from baseline (average of the two daily diary pain levels rated at 8 am on study day −1 and study day 1) to end-of-treatment (average of study days 4 and 5). p Values were obtained using χ2 test for 2 by 2 tables. The co-primary outcome variable was the percent change in pain from baseline. Percent change in each group was not normally distributed; therefore, the nonparametric Mann-Whitney test was used to compare percent change in pain across study groups. Pain reduction was also modeled as a function of group and time using a repeated measures model (generalized estimating equations). All available patient information, including information on patients who later withdrew from the study, was included in this model. The data were fitted using time squared to allow for non-linearity in the relationship between group and time. To adjust for potentially confounding patient characteristics, we controlled for age, gender, pre-study ongoing use of cannabis (yes or no), cause of neuropathy, and baseline daily pain. Secondary outcome variables collected while smoking the first cigarette on day 1 and the last cigarette on day 5 consisted of percent change (relative to pre-smoking baseline for that session) in 100 mm VAS ratings of chronic neuropathic pain, painfulness of the LTS procedure, and areas of secondary hyperalgesia produced by the heat/capsaicin sensitization model to brush and von Frey hair stimuli. For each of these repeated measures, the area under the curve (AUC) for percent change in pain or area of sensitization was computed relative to pre-smoking baseline values (or the average of the pre-smoking values if multiple measurements were available). The total AUC was standardized as average percent change per hour by dividing each AUC by 60. Differences in AUC were compared using Mann-Whitney tests as these data were not normally distributed. Additional secondary outcome analyses of the percent change in total mood disturbance and percent change in the six subscales of the Profile of Mood States was analyzed using independent t tests or Mann-Whitney tests if the data were not normally distributed. Side effect ratings were compared using repeated measures models (generalized estimating equations), using a negative binomial distribution to allow for rare events and over-dispersed data and adjusted for differences in mean recorded side effects across study days and time of day of measurement. The University of California Center for Medicinal Cannabis Research provided assistance with obtaining necessary regulatory approvals, data quality monitoring, and establishing the study’s Data Safety Monitoring Board. A total of 223 patients were assessed for eligibility between May 2003 and May 2005 (figure 2) and 55 individuals were enrolled. Of these, 27 were randomized to cannabis cigarettes and 28 were randomized to placebo cigarettes. 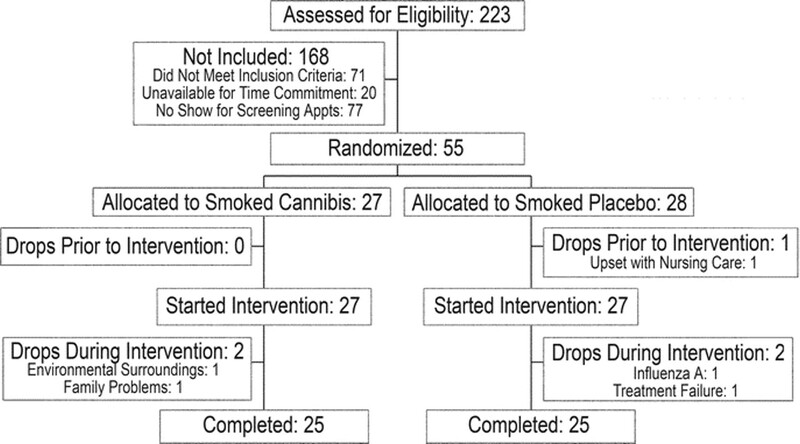 One patient withdrew during the inpatient intervention phase prior to smoking the first cigarette, and four additional patients withdrew prior to completion of the inpatient phase, leaving 25 patients in each group who completed the entire study. All smoking sessions were observed by research staff and completed per protocol. Figure 2. Flow of participants through the trial. Thirty randomized patients completed the experimental pain model portion of the study (14 cannabis, 16 placebo). Of the 25 patients who did not fully participate in this portion of the study, 17 could not tolerate the painful stimulation when tested during the outpatient pre-intervention phase, one developed a blister, one discontinued prior to study day 1, and six did not meet eligibility criteria for the pain model portion (extensive tattooing in one and heat pain detection threshold above 47 °C in five). The patients randomized to cannabis and placebo cigarettes were similar with regard to demographic and baseline characteristics (table 1). Patients were predominantly men with 14 years of HIV infection and 7 years of peripheral neuropathy. Neuropathy was believed to be secondary to antiretroviral medications in the majority of patients in both groups. Over half of patients in each group used concomitant medications for pain, with about one quarter of each group using more than one type of concomitant medication. The most frequently used concomitant medication was gabapentin (15 patients) followed by opioids (14 patients). Median daily pain ratings for the two groups throughout the entire study are shown in figure 3. Baseline (average of day −1 and day 1) daily diary pain ratings were similar (cannabis median 52, interquartile range [IQR] = 38, 71; placebo median 57, IQR = 40, 74). Among those who completed the study, 13 of 25 patients randomized to cannabis cigarettes had >30% reduction in pain from baseline to end of treatment vs 6 of 25 patients receiving placebo cigarettes (52% vs 24%; difference 28%, 95% CI 2% to 54%, p = 0.04). The median reduction in chronic neuropathic pain on the daily diary VAS was 34% (IQR = −71, −16) in the cannabis group and 17% in the placebo group (IQR = −29, 8; difference = 18%; p = 0.03, Mann-Whitney test). In the multivariable repeated measures model, which analyzed available data from all randomized patients, the estimated group difference was slightly larger than the observed difference among those who completed the study (26%; 95% CI = 0, 51; p = 0.05). Figure 3. Time course of the intensity of chronic neuropathic pain as rated on the daily diary VAS at 8 am for the previous 24-hour period. Each point represents the group median. Study admission was at noon on study day –2, the first cigarette was smoked at 2 pm on study day 1, and the last cigarette was smoked at 2 pm on study day 5. Smoking the first cannabis cigarette reduced chronic pain ratings (AUC) by a median of 72% vs a reduction of 15% with placebo cigarettes (p < 0.001, Mann-Whitney test; figure 4A). On day 5 just prior to smoking the last cigarette, median ratings of current chronic pain intensity were lower in the cannabis group (15; IQR = 7, 34) than in the placebo group (29; IQR = 20, 60; p = 0.006, Mann-Whitney test). Smoking the last cigarette further reduced chronic pain ratings 51% in the cannabis group vs 5% in the placebo group (p < 0.001, Mann-Whitney test). Figure 4. First smoking session: time course during the first 95 minutes after smoking of intensity of chronic pain as measured on the visual analog scale (A; cannabis n = 25, placebo n = 25), painfulness of LTS (B; cannabis n = 14, placebo n = 16), and areas of secondary hyperalgesia to brush and von Frey hair stimulation (C and D; cannabis n = 14, placebo n = 16). Mean ± 95% CI. 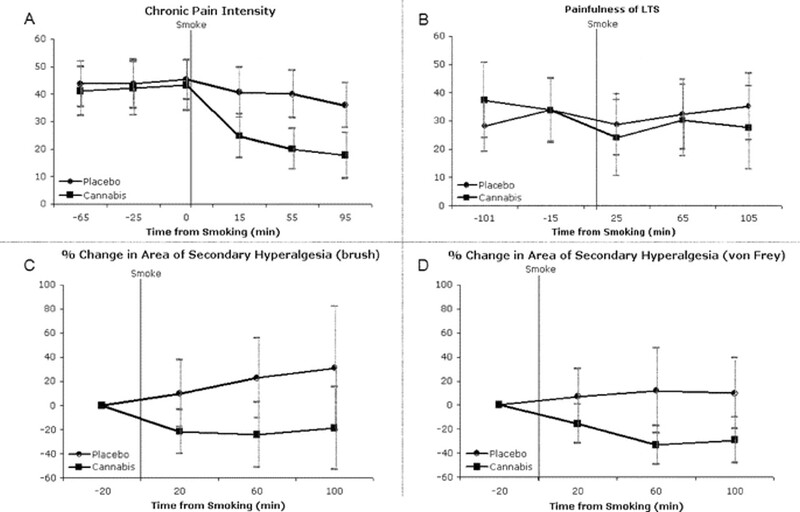 In the 30 patients who underwent the pain model portion of the study, LTS (a measure of acute analgesia to noxious heat stimuli) did not appear to be substantially reduced by smoking the first cigarette on day 1 in either group (figure 4B, median = −22% for cannabis and −5% for placebo; p = 0.31). Areas of experimental heat/capsaicin secondary hyperalgesia on the forearm were similar in the two groups prior to smoking the first cigarette. Active cannabis reduced the area to both brush and von Frey hair stimuli compared to placebo (median = −34% vs −11%; p = 0.05 and −52% vs + 3%; p = 0.05; figure 4, C and D). Smoking the last cigarette on day 5 did not alter the painfulness of the LTS procedure or reduce the areas of secondary hyperalgesia in either group. Safety and mood effects of cannabis. No patient withdrew from the study because of adverse events. One episode of grade 3 dizziness related to study medication occurred in the cannabis group. One case of transient grade 3 anxiety possibly related to study medication was reported in each group. Both patients received a one-time dose of lorazepam. No other patients required psychotropic medications for treatment of dysphoric effects. No episodes of hypertension, hypotension, or tachycardia requiring medical intervention occurred. Mean recorded side effects were low in both study groups. However, side effects ratings were higher in patients in the cannabis group, as shown in table 2, for anxiety (p = 0.04), sedation (p < 0.001), disorientation (p < 0.001), confusion (p < 0.001), and dizziness (p < 0.001). Although these differences were significant, the values for both groups hovered closer to zero than one and do not represent any serious safety concerns in this short-term study. The Profile of Mood States indicated a reduction in total mood disturbance during the 5 days of smoking (median −33% cannabis vs −29% placebo; p = 0.28). Although all subscale scores declined in both groups, the only difference was a larger decrease in depression-dejection in the placebo group (median −63% cannabis vs −76% placebo; p = 0.05, Mann-Whitney test). Over a 5-day inpatient intervention period, smoking cannabis cigarettes three times a day reduced HIV-SN pain by 34%, significantly more than the 17% reduction with placebo cigarettes. A >30% reduction in pain has been validated as a clinically significant level of improvement.23 In the current study, half (52%) of those randomized to cannabis experienced at least a 30% reduction in pain, while a quarter (24%) of those randomized to placebo experienced a similar reduction in pain. In addition to patient-reported changes in ongoing chronic pain, smoked cannabis attenuated the cutaneous hyperalgesia associated with central neuronal sensitization produced by a standardized experimental pain model. Although one cannot entirely exclude pain relief due to relaxation, a high, or unblinding, the mood effects recorded argue against such an explanation. Only one of the six Profile of Mood States subscales (depression-dejection) showed a significant group difference, and actually favored placebo. Moreover, ratings of side effects in the cannabis group were low. The rigorous experimental pain model outcome measures are novel to each patient and not strongly associated with expectations of relief of chronic pain. Areas of secondary hyperalgesia are mapped by an investigator while the patient looks away, and thus may be less subjective than pain intensity ratings on a VAS scale. Therefore, the present study provides evidence that cannabis has analgesic effects on acute central neuronal sensitization produced by the experimental pain model as well as on the neuronal mechanisms associated with painful HIV-SN. The results reported here in neuropathic pain patients exposed to an experimental pain model are consistent with preclinical pain model studies with cannabinoids. Systemic cannabinoids are effective in animal models of acute mechanical and thermal pain, inflammation and hyperalgesia, and nerve injury.29–35 In healthy human volunteers, smoked cannabis increased pressure pain tolerance thresholds.36 The present study in chronic pain patients also shows an effect on experimental hyperalgesia. Although smoked cannabis did not appear to suppress the painfulness of the LTS procedure (analogous to the hot plate or tail flick test in animals), this may reflect the relatively low concentration of delta-9-THC in the study cigarettes. The authors thank study participants; the General Clinical Research Center nursing staff; Sheila Huang, PharmD; Jessica Possehn and Marlene Berro from the Pain Clinical Research Center; Joan Hilton, DSc, and Peter Bacchetti, PhD, at the UCSF Department of Biostatistics and Epidemiology; and Heather Bentley at the University of California Center for Medicinal Cannabis Research for her assistance with regulatory affairs, data quality management, and interaction with the Data Safety Monitoring Board. Supported by the University of California Center for Medicinal Cannabis Research and NIH Grant 5-MO1-RR00083. Dr. Rowbotham received support from NINDS K24 NS02164. Received August 1, 2006. Accepted in final form October 30, 2006. So YT, Holtzman DM, Abrams DI, Olney RK. Peripheral neuropathy associated with acquired immunodeficiency syndrome. Arch Neurol 1988;45:945–948. Sacktor N. The epidemiology of human immunodeficiency virus-associated neurological disease in the era of highly active retroviral therapy. J Neurovirol 2002;8(suppl 2):115–121. McArthur JC, Brew BJ, Nath A. Neurological complications of HIV infection. Lancet Neurol 2005;4:543–555. Simpson DM, McArthur JC, Olney R, et al. Lamotrigine for HIV-associated painful sensory neuropathies: a placebo-controlled trial. Neurology 2003;60:1508–1514. Hahn K, Arendt G, Braun JS. A placebo-controlled trial of gabapentin for painful HIV-associated sensory neuropathies. J Neurol 2004;251:1260–1266. Hugen PW, Burger DM, Brinkman K, et al. Carbamazepine-indinavir interaction causes antiretroviral therapy failure. Ann Pharmacother 2000;34:465–470. Simpson DM, Dorfman D, Olney RK, et al. Peptide T in the treatment of painful distal neuropathy associated with AIDS: results of a placebo-controlled trial. Neurology 1996;47:1254–1259. Kemper CA, Kent G, Burton S, Deresinski SC. Mexiletine for HIV-infected patients with painful peripheral neuropathy: a double-blind, placebo-controlled, crossover treatment trial. J Acquir Immune Defic Syndr Hum Retrovirol 1998;19:367–372. Keiburtz K, Simpson D, Yiannoutsos C, et al. A randomized trial of amitriptyline and mexiletine for painful neuropathy in HIV infection. Neurology 1998;51:1682–1688. Shlay JC, Chaloner K, Max MG, et al. Acupuncture and amitriptyline for pain due to HIV-related peripheral neuropathy: a randomized clinical trial. JAMA 1998;280:1590–1595. Paice JA, Ferrans CE, Lashley FR, Shott S, Vizgirda V, Pitrak D. Topical capsaicin in the management of HIV-associated peripheral neuropathy. J Pain Symptom Manage 2000;19:45–52. Calignano A, LaRana G, Giuffrida A, Piomelli D. Control of pain initiation by endogenous cannabinoids. Nature 1998;394:277–281. Walker JM, Huang SM. Cannabinoid analgesia. Pharmacol Ther 2002;95:127–135. Petersen KL, Maloney A, Hoke F, Dahl JB, Rowbotham MC. A randomized study of the effect of oral lamotrigine and hydromorphone on pain and hyperalgesia following heat/capsaicin sensitization. J Pain 2003;4:400–406. Petersen KL, Rowbotham MC. A new human experimental pain model: the heat/capsaicin sensitization model. Neuroreport 1999;10:1511–1516. Foltin RW, Fischman MW, Byrne MF. Effects of smoked cannabis on food intake and body weight of humans living in a residential laboratory. Appetite 1988;25:577–582. Petersen KL, Jones B, Segredo V, Dahl JB, Rowbotham MC. Effect of remifentanil on pain and secondary hyperalgesia associated with the heat-capsaicin sensitization model in healthy volunteers. Anesthesiology 2001;94:15–20. Dirks J, Petersen KL, Rowbotham MC, Dahl JB. Gabapentin suppresses cutaneous hyperalgesia following heat/capsaicin sensitization. Anesthesiology 2002;97:102–107. Dirks K, Petersen KL, Dahl JB. The heat capsaicin sensitization model: a methodological study. J Pain 2003;4:122–128. McNair DM, Lorr M, Droppleman LF. Manual for the Profile of Mood States (POMS). San Diego: Educational and Industrial Testing Service, 1971. NIH Division of AIDS Table for Grading Severity of Adult Adverse Experiences, August 1992. Available at: http://rcc.tech-res-intl.com/tox_tables.htm. Accessed March 6, 2006. Jay C, Shade S, Vizoso H, et al. The effect of smoked cannabis on chronic neuropathic and experimentally-induced pain in HIV neuropathy: results of an open-label pilot study. 11th Conference on Retroviruses and Opportunistic Infections 2004: abstract 496:243. Farrar JT, Young JP Jr, LaMoreaux L, Werth JL, Poole RM. Clinical importance of changes in chronic pain intensity measured on an 11-point numerical pain rating scale. Pain 2001;94:149–158. Finnerup NB, Otto M, McQuay HJ, Jensen TS, Sindrup SH. Algorithm for neuropathic pain treatment: an evidence based proposal. Pain 2005;118:289–305. Rowbotham M, Harden N, Stacey B, Bernstein P, Magnus-Miller L. Gabapentin for the treatment of postherpetic neuralgia: a randomized controlled trial. JAMA 1998;280:1837–1842. Backonja M, Beydoun A, Edwards KR, et al. Gabapentin for the symptomatic treatment of painful neuropathy in patients with diabetes mellitus: a randomized controlled trial. JAMA 1998;280:1831–1836. Rowbotham MC, Twilling L, Davies PS, Reisner L, Taylor K, Mohr D. Oral opioid therapy for chronic peripheral and central neuropathic pain. N Engl J Med 2003;348:1223–1232. Eisenberg E, McNichol ED, Carr DB. Efficacy and safety of opioid agonists in the treatment of neuropathic pain of nonmalignant origin: Systematic review and meta-analysis of randomized controlled trials. JAMA 2005;293:3043–3052. Grunfeld Y, Edery H. Psychopharmacological activity of the active constituents of hashish and some related cannabinoids. Psychopharmacologia 1969;14:200–210. Buxbaum DM. Analgesic activity of 9 -tetrahydrocannabinol in the rat and mouse. Psychopharmacologia 1972;25:275–280. Chesher GB, Dahl CJ, Everingham M, Jackson DM, Marchant-Williams H, Starmer GA. The effect of cannabinoids on intestinal motility and their antinociceptive effect in mice. Br J Pharmacol 1973;49:588–594. Sofia RD, Vassar HB, Nalepa SD. Correlations between pathological changes in the hind paws of rats with adjuvant arthritis and their response to anti-inflammatory and analgesic drugs. Eur J Pharmacol 1973;24:108–112. Moss DE, Johnson RL. Tonic analgesic effects of delta 9-tetrahydrocannabinol as measured with the formalin test. Eur J Pharmacol 1980;61:313–315. Li J, Daughters RS, Bullis C, et al. The cannabinoid receptor agonist WIN 55,212-2 mesylate blocks the development of hyperalgesia produced by capsaicin in rats. Pain 1999;81:25–33. Herzberg U, Eliav E, Bennett GJ, Kopin IJ. The analgesic effect of R(+)-WIN 55,212-2 mesylate, a high affinity cannabinoid agonist, in a rat model of neuropathic pain. Neurosci Lett 1997;221:157–160. Milstein SL, MacCannell K, Karr G, Clark S. Cannabis-produced changes in pain tolerance. Experienced and non-experienced subjects. Int Pharmacopsychiatry 1975;10:177–182. Noyes R Jr, Baram DA. Cannabis analgesia. Compr Psychiatry 1974;15:531–535. Noyes R, Brunk S, Avery D, Canter A. The analgesic properties of delta-9-tertrahydrocannabinol and codeine. Clin Pharmacol Ther 1975;18:84–89. Svendsen KB, Jensen TS, Back FW. Does the cannabinoid dronabinol reduce central pain in multiple sclerosis? Randomised double blind placebo controlled crossover trial. BMJ 2004;329:253–260. Rog DJ, Nurmikko TJ, Fride T, Young CA. Randomized, controlled trial of cannabis-based medicine in central pain in multiple sclerosis. Neurology 2005;65:812–819. Attal N, Brasseur L, Guirimand D, Clermond-Gnamien S, Atlamis S, Bouhassira D. Are oral cannabinoids safe and effective in refractory neuropathic pain? Eur J Pain 2004;8:173–177. Woolridge E, Barton S, Samuel J, Osorio J, Dougherty A, Holdcroft A. Cannabis use in HIV for pain and other medical symptoms. J Pain Symptom Manage 2005;29:358–367. Abrams DI, Hilton JF, Leiser RJ, et al. Short-term effects of cannabinoids in patients with HIV-1 infection: a randomized, placebo-controlled clinical trial Ann Intern Med 2003;139:258–299.